Just a quick note to let you know that once again NewLife has come through with another perfect delivery. This is the service that keeps me ordering, I know it will be exactly as I expect. Again thank you for your great service. I am contacting you to let you know that I am extremely pleased with the product I received and the very prompt delivery. I will not hesitate to recommend NewLife Industries to everyone who asks about my new hoodie. And, I am confident that many will want to know about it (I plan to wear it every Friday while the weather is cool). Thank you again, I am very impressed with your company. I wanted to drop you a note about my order from your company. The order arrived on time as promised and the work was outstanding. The detail with the printing was the best I've seen from any place. All the Vets were impressed with the work and order. I received my order and wanted to express how pleased I am with your Products. I have been a customer for a while. Your designs are very good and I am proud to wear T shirts, Jackets and hoodies with your designs. Again thanks for your Quality, fair prices and great Designs, I am proud to wear your stuff!!! Thank you so much for all your help with this very important order. I have been a loyal customer of your company, sometimes ordering three times a year. The professional and courteous customer service is by far exceptional, it is a pleasure dealing with your company. Every day I wear one of my shirts, and it brings attention to the civilians as I call them, that the men and women of the Armed Forces have defended this great country in the past, and present for their families, and ours without one complaint, to keep this country free of the tyranny that threatens the free world. Those shirts I wear everyday keeps reminding them not to forget our present and future veterans we have their backs. People who create these beautiful shirts for us to wear proudly are true patriots to this country. Thank You. Great quality and sharp design. Wow! You have made six veterans smile again. Thank you. Wonderful job, shirts! This AM received my 2 t-shirts, washed and went out. I must say that came out great and everyone asked where I got them!!! You all did a marveleous job on them and I just had to write and tell you, thank you so much. I'm proud that to wear cause I'm retired army of 25 years and disable vet due to service. You all deserve great praise to your profession. I received the sweatshirts for our group today and they are beautiful. I am so pleased and I'm sure our members will be too. Thank you so much for providing such an excellant product in support of our wonderful veterans. God bless you all!! Over the past few years, I have purhased many shirts from you - all winners. Lately I have gone to polo shirts because [of] my age (80 yrs). I'm writing to tell you the shirts are outstanding. Great material, looks great, very comfortable, and the imprint makes them winners. Keep up the good work! Thank you for your follow up and follow through. You exemplify the mark of a great company. I appreciate your efforts in making sure the customer is satisfied with the product and the service you render. Keep up the great work. You can count on me as a happy customer. I took awhile to receive my order. Your associates told me there would be a waiting period. It was worth the wait, the T-Shirts are beautiful. I will be ordering some more soon. My sincere "Thank You" to you and everyone who made the quality shirts possible. Just a short note to thank you for your outstanding product. We received our order exactly as expected. No surprises. We hope this fund raising order will lead to additional orders with your company. Thanks again. Thank you for your efforts, and for responding so quickly to my questions. I buy a considerable amount of military shirts, equipment, etc. It's nice to do business with a company that really does put customer satisfaction as a number one priority. It is refreshing and appreciated that you place such a high value and focus on serving your customers. My order was 100% correct and the quality of the shirts was outstanding. I will be showing them to the members at our meeting next week. I'm sure they will be impressed. Received our order of nylon and fleece jackets, last week and all members were very pleased with the quality of the products. We were glad to get the e-mail notice and are putting another order together. Thank you again for the great products and service. Received my shipment of shirts yesterday, & all I have heard so far, are raves. Folks are delighted with their shirts, & asked that I tell you so. Thanks again for great quality & delivery as advertised. The T-shirts arrived today - the right number, the right colors, and the quality that we knew to expect from our previous order. Thanks very much. Just wanted to let you know that the Fleece Jackets arrived as promised. Those who purchased them were delighted to receive them. Those who did NOT order same were very unhappy. Their loss, they had plenty of time to place an order. Also, as I traveled around town to other Legions & VFW's I got a lot of compliments on the jackets. Many wanted to know how they could obtain same. I told them that the next time I receive a flier in the mail or online, I would share with them. Again, thanks for excellent service, as usual. Earlier in the year we ordered 40 shirts that were I think a special run for a patriotic holiday. We went through 30 in 3 days, we had visitors from several posts the next week and they cleaned us out of all but 1 small. Everyone loved them and the personalization was a huge draw. We are preparing to place another order, larger than the 1st one, and we are all excited. We all wanted to let you know how they liked the shirts and how impressed at the art work done on them. You may be pleased to know we used the subject t-shirts (POW-MIA) as a Memorial Day Fund Raiser. The monies raised will be given to a needy veteran or a veteran with family on or before Memorial Day Monday May 30th. Your patriotic shirts were well received and made for a successful fund raiser. Just wanted to thank for the recent order received Monday, 14 Feb., 2011. Most of the shirts have already been delivered to the purchasers, & they are all delighted with their new shirts, including yours truly. The only complaints are coming from those who missed seeing the Advert you had sent me several weeks ago. Now they all want one. I told them there is always a possibility that NewLife may advertise this shirt again, & if so, I will make sure they know about it. Just received an initial order of 12 shirts for Legion Post 300 in San Antonio, and if my fellow Legionnaires are as pleased as me they will surely be open to future business with your firm. We will look forward to the next deal priced offering on orders of 12 or more. Customizing our shirts with organization name and town is particularly important to us too. Many thanks for the quality shirts at a fair price structure. Just a short note of thanks for the very professional results of the Veteran's T Shirt I received yesterday. Kudos for those who designed, printed, shipped and sales force on the excellent item. I will be wearing it here in Phoenix on Veteran's Day Parade in November. Thank You again and your company for an outstanding job. My shirts arrived just as I had ordered. I was impressed with the letter promising prompt fixing of any problems...won't have to test them, but nice to know some businesses are still based on service to the customer. I like the POW/MIA emblem...when my friends see the shirt, they will probably want one themselves. I received my order of shirts on 3/16/2009, the exact date that [I was told] it would be shipped. I showed off the shirts at our Vietnam Veterans Chapter Meeting on Tuesday 3/17, and everyone thought that they looked so nice! The Members were all happy and Proud that we had ordered these shirts to sell at our Veterans Memorial Booth at the South-East Texas State Fair, here in Beaumont Texas. We are raising funds for a "All Veterans Memorial" Monument here in Beaumont, which we hope to unveil on Veterans Day this year and your Patriotic Shirts will help us achieve our goal. Thanks so much, for your support of our Country, by making Newlife Patriotic goods available to our Public, we as Military Veterans appreciate it so much. I just had to write you. I must compliment the Customer Service letter you included with my order. I have never been so impressed by any customer service action as I have been by this letter. How wonderful finally to find that someone out there does actually care about the service they provide to the customer. The shirts I ordered are beautiful and fit very well. I don't have a complaint, however, I'm glad you have the attitude you do in case I did. I will certainly reward your concern to my fellow marines. Do keep up the excellent work. "I'd like to first offer my appreciation for the continued support and care we have received from NewLife Industries. Again these t-shirts are just amazing and beyond that the service provided by your folks is just outstanding. 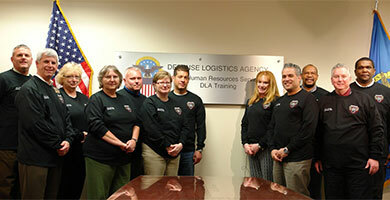 Here at DLA Training Columbus we are thrilled as each year we are able to organize our Memorial Day campaign in honor of the fallen, the prisoners of war and the missing in action soldiers who have given the ultimate sacrifice." 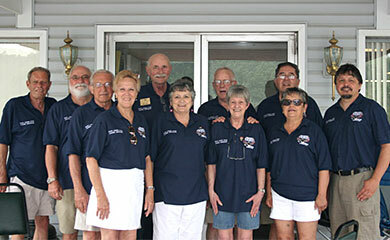 --Sent by John R.
"Picture of Elks group in shirts from NewLife. Polos are very popular with our members, always have a number of people who missed initial order and wanted to know if they could still get a shirt." 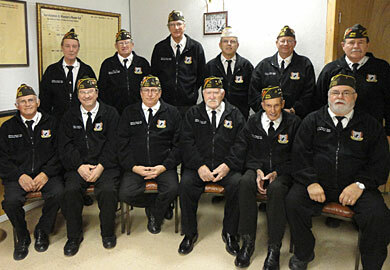 --Sent by Kent F.
"This past spring Bismarck VFW Post 6947 purchased fleece jackets from your company. Our team members are very proud of the jackets and are complimented on how sharp they look. The jackets are really comfortable and warm on the chilly days when we have a service. Thanks again for a quality product." --Sent by Joe S.